Anindo Chatterjee is the most successful and prominent table exponent from Bengal today-a region which did not sire the table but nonetheless has contributed incalculably to the development of table through learning and audience support. The late Jnan Prakash Ghosh’s contribution to the proliferation of table expertise and knowledge in Bengal is unforgettable and among the large multitude of students of the maestro, running veritably into generations now, Anindo Chatterjee’s name finds itself at the pinnacle of popularity. 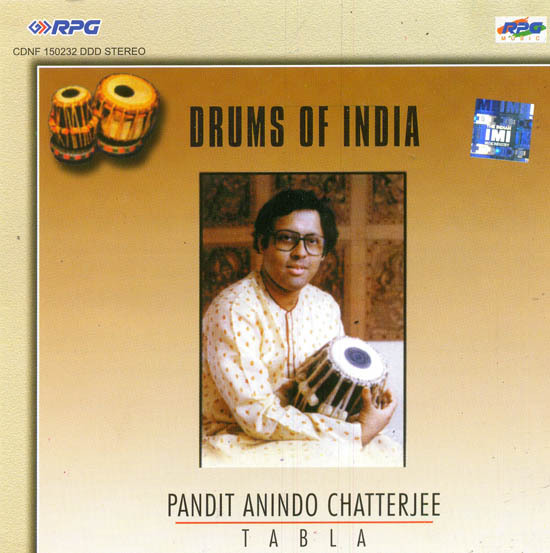 Bold and clear execution of syllables, pinpoint precision in rhythm and cross-rhythm and finally a colossal repertoire of composition and improvisational techniques make Anindo Chatterjee’s solo percussionist concerts a joy for the layman as well as the connoisseur. The table grew with the development of ‘Khayal’ in vocal music and ‘Kathak’ in dance, gradually overshadowing its precursor the traditional pakhawaj, which is co-eval with the esoteric Dhrupad system. This two part drum is comprised by the right hand tabla and the left hand ‘bayan’ or ‘dagga’. The slimmer tabla with its tunable sharp lyrical sounds is the main orator with the base support provided by the sounds on the ‘bayan’. The sounds are lighter, sharper and allow for more lyrical expression.